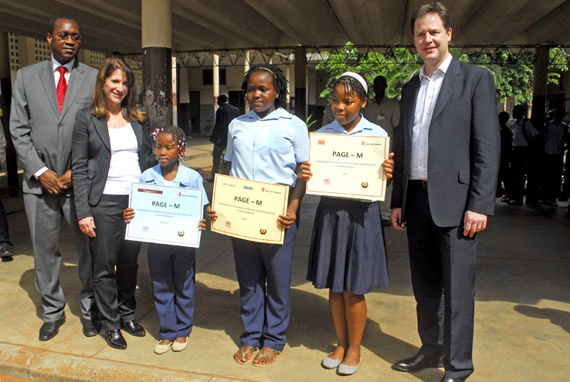 Here’s my latest blog on the Huffington Post website, from my visit to Mozambique and Ethiopia with Deputy Prime Minister Nick Clegg. Today I met a future doctor, accountant and engineer. They were all 13 year old girls. The aspirations of these Ethiopian girls is heartening. The engineer says she wants to train to help “build up her country”. I wouldn’t bet against her doing just that. And the UK Department for International Development (DFID) is working with Ethiopia to make sure she is joined by many others. The deputy prime minister and I are in Kokebe Tsebeh school in Addis Ababa this morning to launch the first Girls Education Challenge Fund projects in Ethiopia, following a launch in Mozambique yesterday. These projects together will help educate 89,000 girls in remote areas, targeting whatever holds them back – using radio to emphasise the benefits of girls’ education to the community, giving grants for uniforms to the poorest students and bicycles to the most remote, and making schools feel safer. But this is just the start, with the Challenge Fund due to benefit one million girls in total around the world. Girls education just makes sense. With education, girls are likely to have children later and are less likely to experience HIV or AIDS. Its not just the health benefits for the girl – benefits often accrue to any children she may have too. And each year of education can add around 10-20% to her salary later in life. We went on to meet Bethlehem Tilahun at her SoleRebels shoe factory. She’s showing just what women can achieve here, building up a business from scratch to now employ 120 people making fantastic shoes (Nick Clegg was given a rather stylish bright yellow pair, with recycled tyre soles). And she did it with little help. How can we make more Bethlehems? Ethiopia and its partners, including DFID, are working on just that. Maybe access to finance or business training is the answer. Maybe extending education to those without, particularly girls, will help. Either way, Ethiopia and its girls are on the move. Sometimes in bright yellow shoes.